French group Rékupertou is coming at your doorstep to perform “The Acoustic Transformers” as part of Arts in Your Neighborhood. Initiated by the National Arts Council, Arts in Your Neighborhood is a month-long series of engaging and fun arts activities aiming to provide quality and enriching arts experiences at various locations across the island. This season, look out for many programmes taking place in or inspired by the town of Tampines, from 7 to 24 March. “The Acoustic Transformers” is a group of five musicians who interpret varying musical styles such as reggae, calypso and salsa with a unique twist. 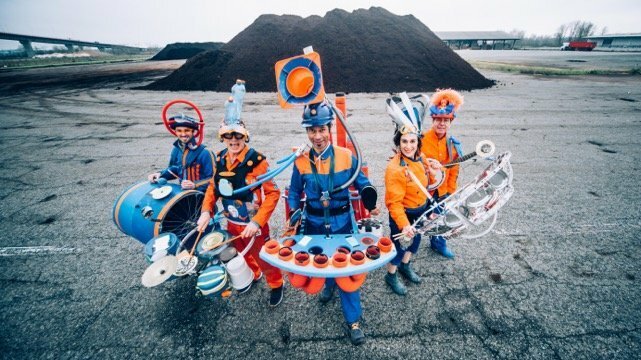 Featuring covers as well as original music, the band uses instruments made from recycled materials and other quirky objects. Come experience the “tubatong”, played with flip flops, or the “Piti Pa” which produces sounds made by stainless steel dishes. Be prepared for a surprising new orchestral experience! Rékupertou is a French music and theatre company from Nantes, France, with extensive experience in multi-faceted music composition and instrument-making. Recycling elements from trash is a main theme in their spectacular musical and educational endeavours. Find out more about Arts In Your Neighborhood programme here.